Normally torn seems on shoes, briefcases, bags, marquees, tents and sails require professional repairs from an specialist. 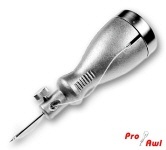 The Pro-Awl is the quick self-made solution. Inside the hollow metal handle there is a bobbin with tear-resistant sewing thread. Pull thread through slot and then through thread guide hole and needle eye which is screwed tight in the front. After the first stitch through the material, you pull the thread to a length twice the seam that is to be sewed. Every time you pull back the awl you obtain a thread loop. Feed the lower thread through this loop. At this point it very helpful to use the shuttle, supplied with the product. Pull both threads tight and the first stitch is fastened. After several repetitions you quickly receive seem, similar to a seem from a sewing machine. After a little bit of practicing you will be able to produce a 30 cm seem in less than 10 minutes. To be honest, this procedure is easier to follow than to describe. Further information at www.pro-awl.com.